...that the Fallen are split into rival Houses? "We are they who created themselves out of themselves and died in the creation. No longer merely the god in the machine, but the machine in the god. ~consume enhance replicate~ Here we rise, made equal at last to that which we worship. ~consume enhance replicate~"
Aksis, Archon Prime was the leader of the Devil Splicers and the latest claimant to the title of Archon of the House of Devils when the SIVA Crisis occurred. "These memories in my mind are not my own. They belong to a past version of myself, a different being entirely. ~consume enhance replicate~ One who could die. ~consume enhance replicate ~ I am that no longer. ~"
Once a disgraced machine priest, Aksis returned to his broken House after the recent loss of its Archon and Prime Servitor and claimed the title of Archon for himself. Aksis ordered the Devils and the Splicers to find and pillage every Golden Age research lab they could find for anything that could aid them in their fight against The City. Their efforts proved fruitful as they had found SIVA, a dangerous nanotechnology from the Golden Age, deep in the walled-off Plaguelands. 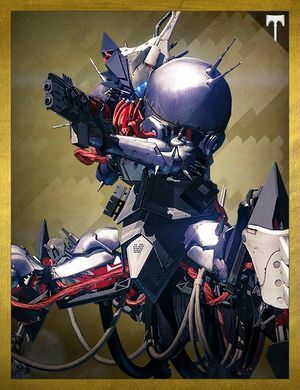 Aksis was among those who believed they could use SIVA to become the machines they worshiped, instead of just finding another god to worship. Within the SIVA server farm, Aksis modified himself with SIVA extensively in pursuit of godhood, to the point where he was more machine than Fallen and had lost all need for Ether. In his new "ascended" state, Aksis named himself Archon Prime and begun the mission to spread SIVA to the rest of the Fallen and destroy the Guardians. He lurked in his Perfection Complex deep beneath the Cosmodrome while his Splicers gathered SIVA offerings for him as tribute. At the time of the SIVA Crisis, he was the most powerful Fallen to have ever existed, until a fireteam of Guardians assassinated him within his Perfection Complex. Aksis is the final boss of the raid, and as such, he has been tuned to be the most difficult encounter yet. His boss fight has two phases. In phase one, his upper body will be hanging from the ceiling and will be completely immune to all Guardian attacks. He will create SIVA Nodes which serve as containment cores that, if not destroyed, will allow him to summon a critical density of SIVA, which will wipe the team. The only way to destroy these cores is by using SIVA Charges. To obtain a SIVA Charge will require a special strategy. Shock, Scorch, and Null Splicer Captains will spawn, one on the left, one in the bottom center, and one on the right. These must be killed in a timely manner so that their cannons will drop. You will need these cannons for when the Shock, Scorch, and Null Splicer Servitors show up; they can only be destroyed by using the cannon of their respective element, and they must be destroyed fast, before they reach a download plate, or Aksis will then wipe the team due to a critical SIVA density. Not only that, but these Servitors will drop the SIVA Charges that you need in order to damage the containment cores. This process repeats three times: the first time will have two cores, the second will have three, and the third will have seven. Once all these cores are damaged, Aksis will temporarily shut down and the room will go dark. You might think that the fight would be over, but remember, this is only phase one. Phase two has a completely different structure. Aksis' upper body will detach from the ceiling and connect with his lower body, which has multiple spider-like legs, thus revealing his true form. He will stay in the center of the room and hammer you with suppressive fire from afar using his SIVA cannon, which has two separate firing modes. The first firing mode is a single Solar bolt that generates a large SIVA Swarm upon detonation. These swarms greatly obscure the player's vision and rapidly eat away at their health. The second firing mode is a barrage of multiple projectiles that have a large blast radius. While Aksis is doing this, he will, again, remain fully immune to all attacks until three SIVA Charges are thrown at him, using the same strategy from phase one. Once this has happened, Aksis will teleport to another location, and three random Guardians will become "Empowered". One of the Guardians with this buff must run up to him and attack his vulnerable backside (Preferably the one closest to him). This will momentarily stun him, thus beginning the damage phase. This damage phase will happen three times in a row before he teleports back to the center of the room to fill the room with a critical density of SIVA. Once this happens you must go to the back of the room where there will be four lit pillars. Your entire team must jump on the same pillar only due to the fact that when your team uses a pillar it will go dark and you cannot use it again. But if your entire team successfully gets to a pillar, you will survive the crisis and the phase will start again. Please note that when Aksis gets to about 5% health he will teleport to the center and he will start self-destruct mode in a last ditch effort to kill the fireteam. You will need to shoot and kill him quickly before he wipes your team. The Heroic Mode version of Aksis remains largely unchanged, but it can throw teams off guard if they aren't paying attention. For phase one, the major change is that in addition to killing Splicers during the add phase, you also have to watch out for SIVA Turrets that appear on the ceiling. These turrets are capable of doing serious damage at a fast rate, but can be temporarily disabled for a moment before they reactivate, allowing the team to briefly avoid focusing on them. For phase two, the team needs to throw seven SIVA Charges instead of three to start the damage phase. This will take a bit longer because there will be two each of Shock Servitors, Scorch Servitors, and Null Servitors. These Servitors, just like in normal mode, can only be destroyed by a Shock Cannon, Scorch Cannon, and Null Cannon respectively. When the Aksis Challenge is active, Guardians must supercharge their team during every stun part of the damage phase. In others words, an Empowered guardian who is not on a side where Aksis teleports to be stunned must dispense their buff into an active Servitor plate in the boss room, supercharging their team's supers. This has to be done before an Empowered guardian can stun Aksis to inflict damage to him. Supercharging has to be done during each of the three stun parts of every damage phase. Failure to do so will result in the challenge not registering, and the team must wipe in order to do it correctly. After the first phase of the battle is finished, should the players delay in shooting the harness holding Aksis in place, Aksis will roar or growl every now and then. This is possibly a signal to the players that the Raid isn't over yet. His head design is vaguely similar to Aksor, Archon Priest. Aksis' name is pronounced the same way as Axis. He is the fourth Fallen boss to laugh in-game, the others being Draksis, Winter Kell, Taniks, the Scarred, Pirrha, the Rifleman, Araskes, the Trickster, Kaniks, the Mad Bomber and Skolas, Kell of Kells. Aksis is the first Fallen Ultra boss which possesses two arms, instead of the usual four. In addition to this, Aksis is the only Fallen enemy as well as being the only enemy of the Last City to have more than two legs. If you go to where Aksis spawns, you will see the SIVA symbol show up on your screen for a few seconds until you die. Aksis is labelled as a SIVA enemy and not a Fallen enemy. All Wrath of the Machine weapons, such as Outbreak Prime, and any other weapons that has the perk of dealing extra damage to Fallen will not receive the damage bonus against Aksis. Due to his multiple legs, Aksis is the tallest Fallen so far in the Destiny universe. Aksis's original name in development was Meksis, but this name was determined to be not good enough for the final boss and was instead used for the Siege Engineer on the Siege Engine. The Heavy Shank S.A.B.E.R.-2 built by "rising archons" through Servitor parts is likely to be Aksis' creation as they were attacking Rasputin to get to SIVA. Also during the strike the Sepiks line of Servitors, Sepiks-23, is also revived. The strike drops a special weapon drop called the "Barons Ambition" which reads "To crack open that depraved Earth-Servitor. To use its secrets to reclaim the Great Machine...". The Servitor is a reference to Sepiks Prime who is later revived as Sepiks Perfected and at one time Aksis was a Baron before he became Archon by taking control of the Archon's Forge.